Geologist Jeff Vervoort with a 1.86-billion-year-old piece of gneiss he found near Clarkia, Idaho, typical of the rocks at the core of the ancient supercontinent of Rodinia. The small circle on the map indicates the approximate location of present-day Pullman. A cantaloupe-sized chunk of granite from the other side of the world has revealed that nearly a billion years ago, the Palouse was "ground zero" when a supercontinent called Rodinia broke up. "This was the edge of the continent," says Washington State University geologist Jeff Vervoort, looking out over the rolling hills from his office on the 10th floor of Webster Hall. Vervoort coaxed the story from the small boulder, which was found by his colleague John Goodge of the University of Minnesota-Duluth. Vervoort and Goodge had studied many other ancient rocks, and to them the chunk looked like a "one-point-four," part of a distinctive belt of granite that stretches across much of North America. "They're all about the same age--1.4 billion years old--and they have very unique characteristics," says Vervoort. The intriguing thing was, Goodge found his rock atop a glacier in eastern Antarctica. If it was indeed a 1.4, Antarctica and North America must have been cheek-by-jowl back when the 1.4 granite first formed--on the ancient supercontinent of Rodinia. Many of us have heard of Pangaea, the supercontinent that split apart to form today's continents. What most of us don't know is that Pangaea, which existed about 250 million years ago, was just the latest in a series of supercontinents. Earth's land masses have crammed together and drifted apart many times in the planet's 4.56 billion year history. Rodinia is the earliest supercontinent geologists have identified. Named after a Russian word for "homeland," Rodinia formed between 1.3 and 1 billion years ago and broke apart about 700 million years ago. But the details of the break-up are sketchy. Geologists haven't been able to tell which present-day land masses were next to each other in Rodinia, and where the cracks were that led to their separation. One possibility was that a major fault ran from eastern Washington and north-central Idaho to the southwestern United States. That's where the belt of 1.4 granite abruptly ends, as if it had been broken off from a larger continuous belt. But if it did break away, what did it break away from? Could the "other half" of the belt be in Antarctica? To determine whether the Antarctic rock matched the North American granite, Goodge sent samples of it to Vervoort for radiogenic isotope analysis, a technique that tracks the radioactive decay of elements over time. Isotopes are forms of a given chemical element that have different numbers of neutrons in their nucleus. Most isotopes are stable, but some undergo radioactive decay and become a "daughter" element. The daughter may be another isotope of the original element or an entirely different element. For example, the isotope of uranium called U-238 (with a total of 238 neutrons and protons) decays to form Pb-206 (lead with 206 neutrons and protons). Another isotope of uranium, U-235, decays to form Pb-207. Radiogenic isotope analysis takes advantage of the fact that each isotope decays at a unique rate that is the same in every sample, no matter where the sample came from. That consistency makes a decaying isotope an excellent clock. So Vervoort measured the uranium and lead isotopes in tiny crystals he extracted from Goodge's rock. Working backward from the proportion of lead isotopes, he figured out when the uranium in the rock had started to decay. He confirmed that the rock was 1.4 billion years old. But did it belong to the same 1.4 billion-year-old belt of granite found in North America? To answer that question, Vervoort measured the amounts of another element pair linked through radioactive decay: an isotope of lutetium and its daughter, an isotope of hafnium. He combined those measurements with the data from uranium and lead to produce the rock's "isotopic signature." Like a geologic fingerprint, the mix of isotopes in a rock can reveal the rock's history and origin. Even after millions of years of being on land masses that were broken apart, buried under ocean sediment, and uplifted by continental collisions, rocks that started out as parts of the same granite belt will still have the same isotopic signature. 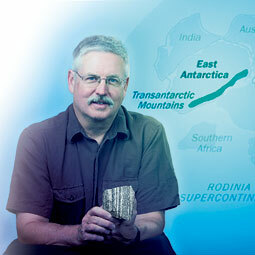 Vervoort found that the signatures of the Antarctic rock and 1.4 rocks from North America matched. 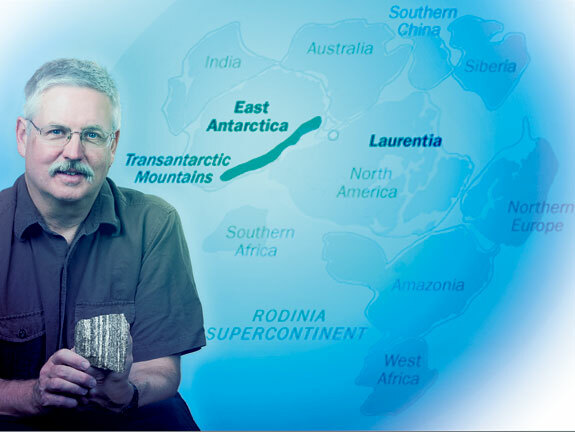 He and Goodge concluded that North America and Antarctica had been joined as part of the supercontinent of Rodinia, and that when Rodinia broke up, one of the fault lines split the belt of granite to which those rocks belonged. Some of the belt moved east with the land that would become North America, and some moved west with the future Antarctica. All of which means that parts of the Palouse were beachfront property almost a billion years ago. The region only became the inland northwest after collisions with other land masses added land to the western border of the fledgling North American continent. Vervoort says radiogenic isotope analysis (in his lab and others) confirms that the very old rocks to the east of Pullman are more than a billion years old, while those to the west are generally less than 200 million years old. The boundary runs along the Clearwater River in Idaho for several miles. Near Lewiston it turns and heads north. "Right about through Pullman," says Vervoort.